Warhammer 40,000 Conquest LCG has been officially announced by Fantasy Flight Games. Although only a rumour last week, the nature of the rumour meant that this was fairly likely to happen. Warhammer 40,000 Conquest is a two player Living Card Game and has players attempting to control planets in the Traxis Sector. The aim of the game is to control three planets with the same symbol. Players control planets by sending their troops into battle on each of the five planets in play. Players will also be able to secretly attack with their high powered Warlord card by using the servo skull dial (think the manoeuvre dials in Star Wars X-Wing) to secretly select a planet. 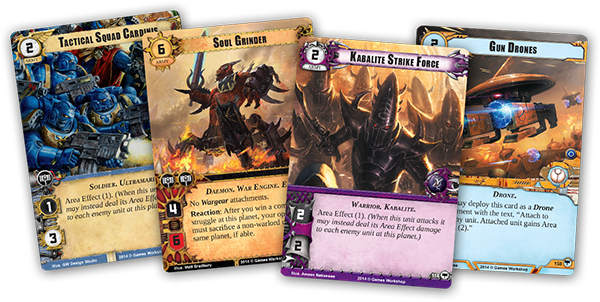 It looks like this isn’t just a carbon copy of Warhammer Invasion, as the planet cards are going to add a lot of variety to the game as well as giving players a lot of tactical options to consider. According to the product details only 10 planet cards are included in the core set but it’s safe to assume that these will be expanded in future packs. Some information about Deckbuilding has also been released. Every deck will be based around a Warlord, who will also be joined by their command squad. This dictates the faction that your deck is made from but you are also allowed to include cards from one of the two available allies. 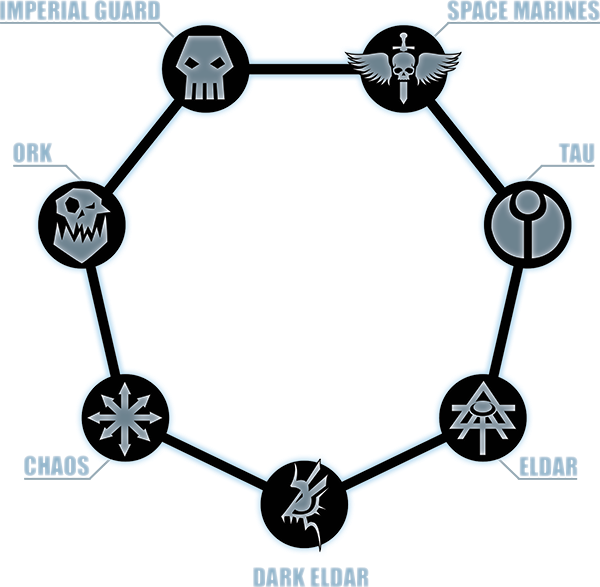 The allies you’re allowed to include are based around an alignment wheel; for example Space Marines can take allies from the Imperial Guard or Tau, Tau can take allies from either Space Marines or Eldar. There are seven factions included in the game and these cover the majority of factions in Warhammer 40,000. Notable exceptions are the Tyranids, Necron and Sisters of Battle, though you can imagine these being included in future big box expansions. The product details for the core set confirm that all seven factions will be included in the core set. I’ll admit that I don’t tend to play LCGs beyond the core set, but I’ve been a Warhammer 40,000 fan since I played Rogue Trader way back in the early 90s. I can see me buying this, lots of this! Time to re-mortgage the house I think. Warhammer 40,000 Conquest will be released the 3rd quarter of 2014, so that will be at Gen Con then.